This article is about the incorporated city formerly known as Castle Pines North. For the neighboring census-designated place, see The Village at Castle Pines, Colorado. 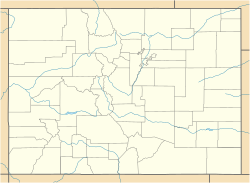 Location of Castle Pines in Douglas County, Colorado. Castle Pines is located at 39°28′18″N 104°53′41″W﻿ / ﻿39.471742°N 104.894827°W﻿ / 39.471742; -104.894827 (39.471742, -104.894827) at an elevation of 6,368 feet (1,941 m). Located on Interstate 25 in central Colorado, Castle Pines is 20 mi (32 km) south of downtown Denver and 43 mi (69 km) north of Colorado Springs. According to the United States Census Bureau, Castle Pines has a total area of 9.01 square miles (23.3 km2), all of it land. As of the 2010 census, there were 10,360 people, 3,493 households, and 2,928 families residing in the city. The population density was 1,149.8 people per square mile (444.6/km²). There were 3,637 housing units at an average density of 403.7 per square mile (156.1/km²). The racial makeup of the city was 92.6% White, 2.6% Asian, 1.1% African American, 0.2% American Indian, 0.1% Pacific Islander, 1.0% from other races, and 2.3% from two or more races. Hispanics and Latinos of any race were 5.5% of the population. In the city, the population was spread out with 33.6% under the age of 18, 3.8% from 18 to 24, 24.8% from 25 to 44, 30.2% from 45 to 64, and 7.6% who were 65 years of age or older. The median age was 39.5 years. The gender makeup of the city was 49.7% male and 50.3% female. Castle Pines is one of the most affluent cities in the United States. The median income for a household in the city was $137,019, and the median income for a family was $147,473. Males had a median income of $118,235 versus $71,399 for females. The per capita income for the city was $49,702. About 0.9% of families and 1.7% of the population were below the poverty line, including 2.9% of those under age 18 and 0.0% of those age 65 or over. As of 2011, 69.5% of the population over the age of 16 was in the labor force. 0.2% was in the armed forces, and 69.4% was in the civilian labor force with 66.8% employed and 2.6% unemployed. The occupational composition of the employed civilian labor force was: 58.3% in management, business, science, and arts; 28.7% in sales and office occupations; 7.6% in service occupations; 4.6% in production, transportation, and material moving; 0.8% in natural resources, construction, and maintenance. The three industries employing the largest percentages of the working civilian labor force were: educational services, health care, and social assistance (17.1%); professional, scientific, and management, and administrative and waste management services (16.7%); and finance and insurance, and real estate and rental and leasing (14.5%). The median home value in the city was $457,500, the median selected monthly owner cost was $2,654 for housing units with a mortgage and $731 for those without, and the median gross rent was $1,294. The City of Castle Pines is a statutory city and follows the Mayor-Council government system. The City receives the majority of its revenue through sales and use tax collections. The City receives a portion of the revenue collected through property taxes, but these dollars are dedicated to fund law enforcement. The residents of the City of Castle Pines North elected their first city officials on February 12, 2008. Castle Pines is home to 5 parks and 14 miles of trails that are 8-feet wide and paved to accommodate a variety of recreational activities. Walking, running and bicycling is permitted on trails, however horseback riding and the use of motorized vehicles is prohibited. The Castle Pines North Metropolitan District maintains most trails in Castle Pines. Students residing in Castle Pines are within the Douglas County School District RE1. Castle Pines is located adjacent to Interstate 25. The city is served by Denver International Airport and nearby Centennial Airport. ^ a b "Active Colorado Municipalities". State of Colorado, Department of Local Affairs. Archived from the original on 2010-11-23. Retrieved 2007-12-05. ^ a b Ivan Moreno (2006-11-06). "Castle Pines North incorporates". Rocky Mountain News. Archived from the original on 2007-11-10. Retrieved 2007-11-09. ^ a b "Colorado Municipal Incorporations". State of Colorado, Department of Personnel & Administration, Colorado State Archives. 2004-12-01. Retrieved 2007-11-09. ^ a b c d e f g h i "American FactFinder". United States Census Bureau. Retrieved 2013-11-02. ^ "About the City of Castle Pines". City of Castle Pines. Archived from the original on 2014-09-21. ^ "Distance Calculator". Infoplease. Retrieved 2013-11-02. ^ "Physiographic provinces of Colorado". Colorado Geological Survey. Archived from the original on 2012-05-24. Retrieved 2013-11-02. ^ "Castle Pines [map]" (PDF). Colorado Department of Transportation. Retrieved 2013-11-03. ^ a b "Douglas County [map]" (PDF). Colorado Department of Transportation. 2012-07-30. Retrieved 2013-11-02. ^ "OMB Bulletin No. 13-01" (PDF). Office of Management and Budget. 2013-02-28. Retrieved 2013-11-02. ^ "Colorado: 2010 - Population and Housing Unit Counts" (PDF). United States Census Bureau. Aug 2012. Retrieved 2013-11-02. ^ "Budget | City of Castle Pines". www.castlepinesgov.com. Retrieved 2016-11-02. ^ Lisa Crockett (2009-12-01). "Castle Pines North elects new mayor and council". The Castle Pines Connection. Archived from the original on 2010-11-20. Retrieved 2009-02-25. ^ "Parks, Trails & Open Space Castle Pines North Metropolitan District". cpnmd.org. Retrieved 2016-07-27. Wikimedia Commons has media related to Castle Pines (city), Colorado. This page was last edited on 28 December 2018, at 15:33 (UTC).